CEREC is a revolutionary way to restore damaged teeth in one visit. 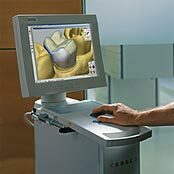 With CEREC, there is no need for us to take an impression and send it to the lab. Using an infra-red camera, a digital “impression” of the prepared tooth is taken. State-of-the-art CAD/CAM software allows us to design every precise detail of your restoration right before your very eyes. Exact design specifications are sent to our on-site “milling machine” to create your restoration. About 20 minutes later, your all-ceramic, color-matched restoration is ready for cementation. No impression, no temporary crowns – no need for a second anesthetic injection.